Drive Along Beas rive to one of its source at Rohtang Pass(3980mtrs) and descend down to Gramphu. From here onward the dirt road follows the Chandra River upstream through seasonal settlement of Chatru to kunzum La. On route we appreciate the wild scenery and hanging Glacier and 6000 meters. Peaks. The Bara Shigri Glacier one of the largest and most impressive in the Indian himalayas. One can have have magnificent views of White Sail and Devachan Massif from Batal before ascending to Kunzum La (4550mtrs) -The gateway to Spiti Valley.The road descends down more or less all the way to Kaza-headquarter of Spiti Valley. Overnight stay at the hotel. Morning visit the famous Ki monastery, 12 kms from Kaza. This century – old Gompa is a labyrinth of rooms and corridors – and at one time also acted as a fort. Also visit the small gompa at Kibber, 9 kms further ahead. Overnight stay at the hotel. 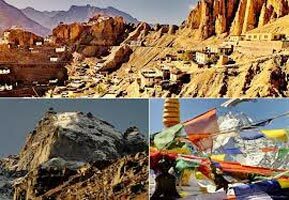 Travel by surface from Kaza to Tabo Enroute visiting Pin Valley, Kungri Monastery, Dhankar Monastery. On arrival check in at guest house. 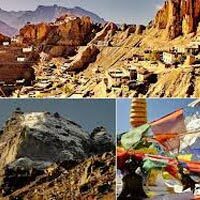 Evening visit Tabo Monastery which was founded in 996 AD by the great teacher Richensang-po, Tabo is renowned for its breathtaking murals and stucco images – and is often called “The Ajanta of the Himalayas. Overnight stay at the hotel. Travel by surface from Tabo to Nako which is located by the banks of lake. Visit the monastery and walk around Village. Later continue drive Enroute viewing confluence of Satluj & Spiti Rivers at Khab. Kalpa village is located in backdrop of Kenner Kailash mountain range. On arrival check in at hotel. Rest of day free to explore Kalpa village. Overnight stay at the hotel. Travel by surface from Kalpa to Sangla Enroute visiting Kamru Fort & village. On arrival in Sangla set up camp or hotel as per your choice. Overnight stay in tents/hotel at Sangla. The Picturesque town of Sangla located on the Banks of the famous Baspa River provides an Ideal location for Adventure Activities as well as visit to Chitkul Village. Sangla homes some ancient monasteries and temples worth a peek. The tents will be prepared at Sangla or hotel along with the bonfire depending on weather conditions. Drive to Sarahan which is approximately 92 Kms from Sangla. The Journey offers a display of true Kinnauri landscapes and vegetation. The village of Sarahan has some spectacular attractions making it a must visit location. Overnight stay in tents or at hotel. Drive from Sarahan to Shimla which is approximately a distance of 184 Kms. Enroute the stop at the attractive town of Rampur will stimulate your explorer enzymes. After the tiring drive, a nice cozy room awaits you and a much needed rest lures you into a rejuvenating rest.